The characteristics of rock and mineral alteration of a rock mass related to a hydropower engineering project in southeastern China are analyzed and presented. 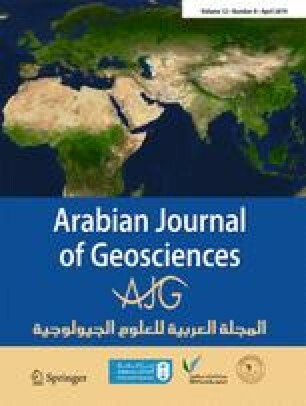 Rock mass alteration is an important engineering geology challenge in the region; in this study, it is shown that the main types of alteration are albitization and formation of clay minerals. The main minerals in the altered rocks are plagioclase, K-feldspar, montmorillonite, illite, and kaolinite and the alteration processes were tracked using the interrelationships between K, Na, Ca, and loss on ignition during formation of illite, montmorillonite, and kaolinite. Laboratory testing of rock physical properties showed that water content, natural water absorption, and saturated water absorption in the altered rocks all gradually increase as the degree of alteration increases. However, rock mass density shows a decreasing trend with increasing alteration, and the degree of alteration exerts little influence on rock particle density. Rock disintegration tests show that the disintegration index decreases as alteration deepens. The Henan Institution of Higher Education Key Scientific Research Project (16A410004) is acknowledged. We thank Warwick Hastie, PhD, and Lucy Muir, PhD, from Liwen Bianji, Edanz Group China (www.liwenbianji.cn/ac), for editing the English text of drafts of this manuscript. The authors also wish to thank the anonymous reviewers for their constructive comments. This study was financially supported by the National Natural Science Foundation of China (no. 41,602,295, U1704243, 41,602,298) and the Doctoral Student Innovation Foundation of North China University of Water Resources and Electric Power. The work was partially supported by the High-level Talents Foundation of the North China University of Water Resources and Electric Power (201501001).